A resolution opposing President George W Bush's decision to send extra troops to Iraq has failed to advance in the US Senate, dealing a blow to war critics. The measure needed 60 votes before the 100-member Senate could begin debate, but it got 49, with 47 voting against. Democratic senators, who backed the motion, said they would raise the issue again, possibly later this week. Although non-binding, it was the first serious effort in Congress to confront the White House over the war in Iraq. Since the US-led invasion in 2003, more than 3,000 US troops and tens of thousands of Iraqis have been killed. 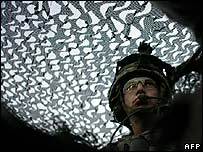 The resolution opposed Mr Bush's plan to send 21,500 additional troops to Iraq, the majority of them to violence-hit Baghdad in an effort to end sectarian clashes. It called on the White House to examine all other possibilities. Mr Bush has said it is something he has already done. It was the first time Democrats had scheduled a fully-fledged debate on the Iraq war since they won control of Congress in last year's mid-term elections. Senate majority leader Harry Reid said the Republican vote meant they were supporting "this president continuing the same policy of failure in Iraq". The text of the bipartisan, non-binding resolution was proposed by senior Republican John Warner and it is unclear what will happen to the measure now. Groups from the left and the right proposed amendments up to the last minute, as senators tried to balance criticism of the Bush administration with loyalty to US troops in Iraq. Several Republicans supported the resolution, but there were not enough to block the efforts of White House loyalists in the Senate to prevent it from coming to a vote. Senate Republican leader Mitch McConnell described the vote as "a bump in the road" and added that GOP lawmakers "welcome the debate and are happy to have it". Some Democrats had said they would oppose the resolution because it did not go far enough. 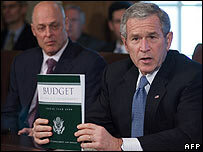 Earlier, Mr Bush sent his budget plan to the Democrat-controlled Congress for approval, requesting extra funding for the conflicts in Iraq and Afghanistan. Almost $700bn (£357bn) is earmarked for new military spending. Senator Reid said that the budget, which also proposes large health care cuts, was not in tune with the needs of ordinary Americans.